Information Technology is not just about what applications you can use; it is about the systems you can support. The CompTIA IT Fundamentals certification is an introduction to the skills required to become a successful systems support professional, progressing onto more advanced certifications and career success. 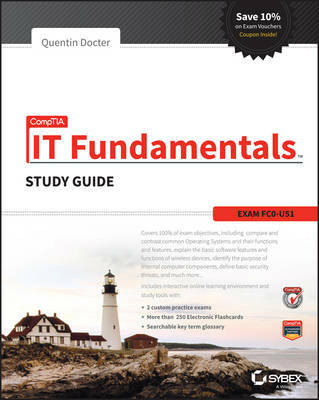 The Sybex CompTIA IT Fundamentals Study Guide covers 100% of the exam objectives in clear and concise language and provides you authoritatively with all you need to know to succeed in the exam. Along with gaining preventative maintenance skills, you will also develop the tools to complete troubleshooting and fault resolution and resolve common issues experienced by the majority of computer systems. The exam focuses on the essential IT skills and knowledge needed to perform tasks commonly performed by advanced end-users and entry-level IT professionals alike, including: * Identifying and explaining computer components * Setting up a workstation, including conducting software installations * Establishing network connectivity * Identifying compatibility issues and identifying and preventing security risks * Managing the safety and preventative maintenance of computers Practical examples, exam highlights and review questions provide real-world applications and uses. The book includes Sybex's interactive online learning environment and test bank with an assessment test, chapter tests, flashcards, and a practice exam. Our study tools can help you prepare for taking the exam?? ?and increase your chances of passing the exam the first time!